the devastation when the old pond was destroyed. What a shock! Yesterday some men hauling backhoes on trucks arrived to work on Valhalla's lower pond. 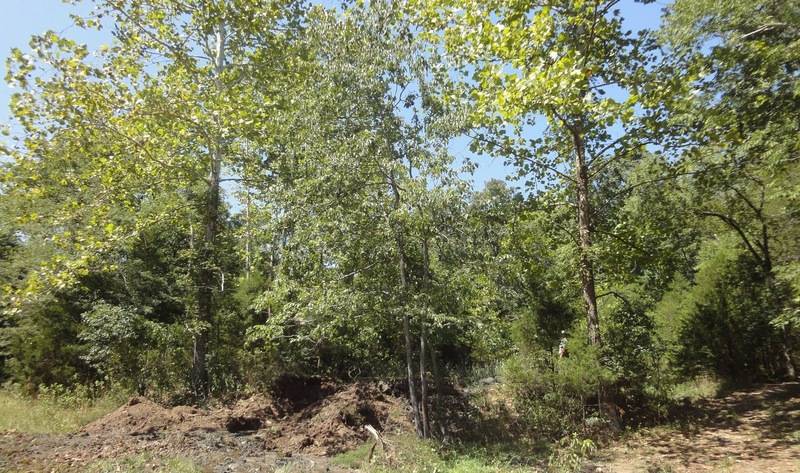 By the afternoon it looked like a bomb had gone off with enormous trees down and a giant crater marking where the old pond had been. What had been a beautiful peaceful little area seemed to be the site of total devastation and tragic environmental destruction. pond itself - while pretty - was dying. Is any of that true? No. 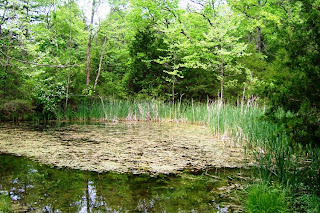 The old pond hadn't been maintained in a very long time and had choked both on thickets of cattails combined with years of leaves shed by giant sycamore trees that were, in turn, sucking most of the remaining water out of it. 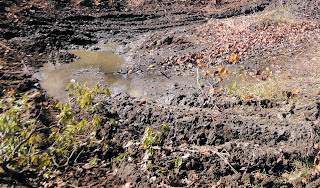 Silt had built up to levels that were slowly turning the pond into a mud bowl. Cattle had free access to it and often waded in to cool off, thus contaminating the water. The pond had reached the end of it's natural life cycle. of the pond that it was mostly hidden from view. Something had to be done, so we contacted the Crooked Creek Soil Conservation District in July for advice. Karla Axel and Water Quality Technician Specialist Mike Parkinson came over to investigate, and after looking things over suggested expanding the size and depth of the pond, removing the trees around it, fencing it off, and installing a water tank for livestock and wildlife to drink from. 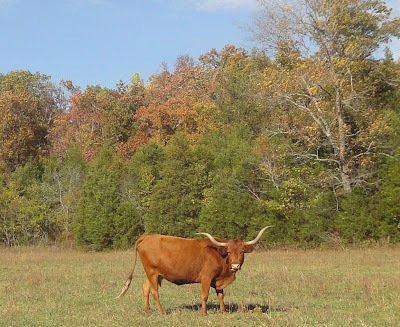 Such an undertaking would require a significant amount of work with heavy equipment and would therefore cost quite a bit, yet Valhalla could apply for a cost sharing grant under the federal Clean Waters Act Section 319 as administered by the State of Arkansas. The pond will be much bigger than before. While we were tempted to put such a costly project off until Valhalla's fundraising programs are further along, it made more sense to do it during severe drought conditions - that is, right away! We applied for and were quickly accepted into the Section 319 grant program. 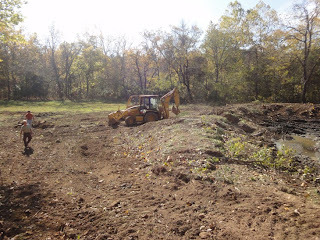 The front retaining wall dam was then breached to drain the pond, which has been drying out for over a month now. Trading a few trees for the promise of a lot of clean water. 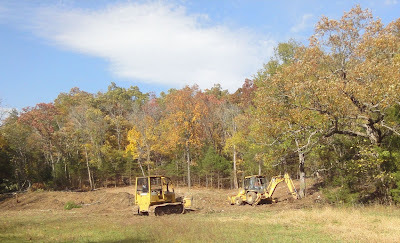 The real work that began yesterday started with knocking down the trees that had choked the old pond out. It was hard to watch those trees coming down but the area is a tiny nook inside a huge property, and in the end animals of all shapes and sizes will benefit. 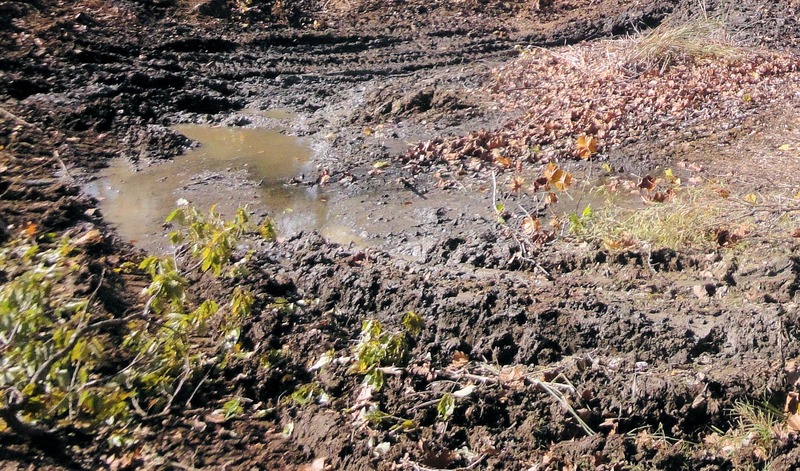 Another benefit already coming out of this pond project: a mountain of leftover nutrient-rich pond muck, the enemy of clean water yet one of the most prized additions to gardening soil. Valhalla's compost pile looks microscopic compared to the tons of precious pond muck. It takes a long, long time to "grow" quality soil out of the mostly rocky gravel with barely any dirt as common throughout the Ozarks. In the coming years we'll be building up the soil with plenty of help from animals, yet in the meantime we'll add quantities of pond muck to Valhalla's raised bed vegetable gardens. "What are you talking about? I never pee'd or pooped in that pond! I liked wading in it, sure, but always walked all the way back to the barn to use the toilet! Of course I did!" Check back soon to see how Valhalla's first pond project progresses, we'll post updates regularly as the work on it continues! Heave machinery such as bulldozer, tractor, lifts passes wherever, it causes destruction. These equipments are usually used for heavy work. These are necessary for construction purposes.